You don't really notice it unless you look for them but, scattered around the campus neighborhoods, there are lots of boulders. Some have been moved here for decorative purposes but most are naturally occurring. They range in size from a few feet to the size of small cars. They're just as common below the ground as above it. Subterranean boulders repeatedly cause problems for construction in the area. Indianola Middle School in 1927, the University Theater in 1945, and the James Cancer Hospital in 1985 were all delayed by the discovery of big rocks underground in inopportune places. 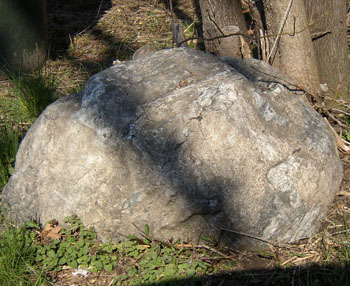 The local boulders are mostly granites, gneisses, and schists. They are not rock types indigenous to Ohio. The bedrock under Columbus is all shale and limestone. Granite is produced by intrusive magmas. Gneiss and schist are rock tortured by heat and pressure deep in the earth. Curiously, these rocks from deep in the earth sit on or near the surface, surrounded by soil and well above the bedrock layers. Class of 1892/ World War I Memorial, Bricker Hall on the Ohio State University campus (originally from the Iuka Ravine). About 70,000 years ago, global temperatures turned markedly cooler. Winter snow and ice in the Arctic didn’t melt in summer but instead built up. Cooler summers added more snow and ice. Polar temperatures suitable for year round ice spread southward. Glaciers began advancing down from northern Canada. About 24,000 years ago, they entered Ohio. The ice reached its maximum extent about 20,000 years ago. 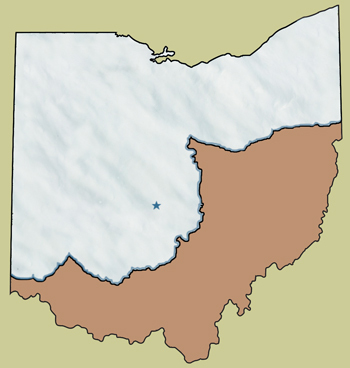 At the peak of the ice age, all of Ohio was covered by ice except for the southeastern section. The ice may have been as much as a mile thick over present day Columbus. Frozen millennia passed and the Earth began warming again. About 18,000 years ago, the ice began to recede. The glaciers withdrew from Ohio about 14,000 years ago. The retreating ice left behind our present day landscape. South flowing rivers like the Scioto and Olentangy evolved to carry meltwater from the ice sheet. The melting ice dropped the debris it had plowed up, scraped off, and pulverized in its 50,000 year southward advance and buried the pre-existing terrain under a 50-100 foot deep blanket of silt, clay, sand, and gravel, creating our present surroundings. Another thing the retreating ice left behind were rocks that didn’t belong. Geologists call them erratics. When the ice melted, rocks that the glacier had picked up on its southward march were dropped, hundreds of miles from their point of origin.